I think that almost every architect has more than one sketchbook in a bookcase at home with one or two sketches and good intentions to fill the rest of it. I bet I have ten or more and some of them have not been opened for a decade or more. My last two trips to Italy, I have finally gotten over my inhibitions (what if I do a bad drawing!?) and carved out the time to sketch regularly. This fall, while my wife Margaret was in Italian language classes, I went out and walked, took pictures and sat and sketched. My goal was to do at least one sketch each day. Linked on Flickr are some of the sketches I did. We spent ten days in Rome, then travelled northeast about 3 ½ hours by bus to the town of Ascoli Piceno in the Le Marche province. It is a vital and economically robust town of 60,000 with a medieval core that dates from the 11th and 12th century. We stayed in an architect’s home overlooking the town that that had been converted to a B&B by his nephew, so you will see lots of views of the towers from above. Urbino was our next stop and focused around a renaissance fortress on a hilltop that is every travel photographers dream. Our last stop was Ferrara, a town about the size of Santa Rosa with an intact walled core dating from medieval and renaissance times. 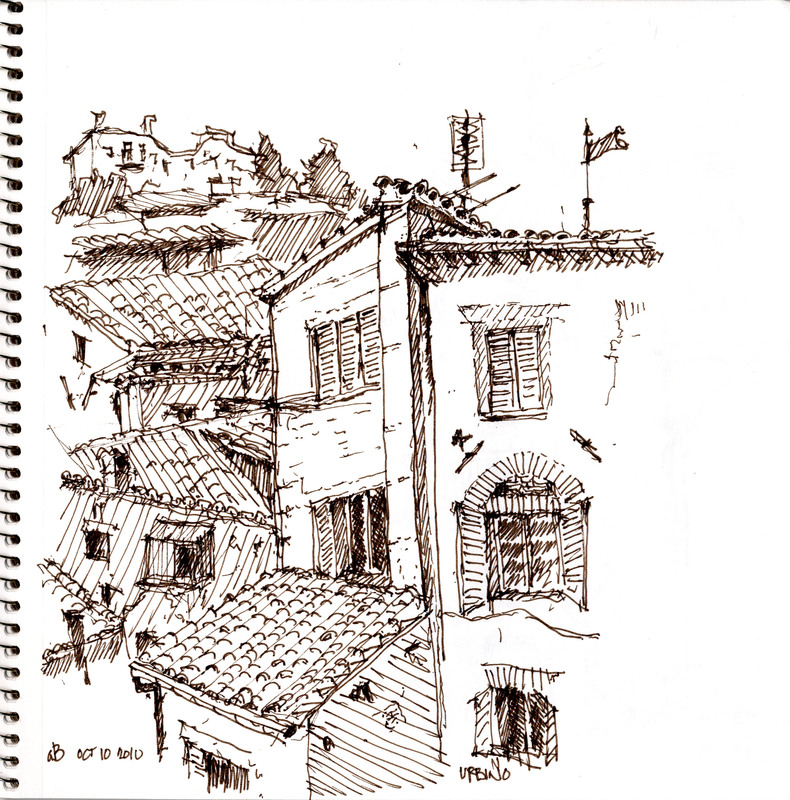 Sketching was a relaxing way of making myself sit quietly in one place for a while and really contributed to making this into a true vacation. I’ve got a couple of slide shows scheduled in January to show both the historic and contemporary facets of our trip.